Updated 3:30pm 4/9/2015: Updated SPC outlook, added NWSNashville graphics, other updates. Summary: Scattered storms today, cold front comes through overnight increasing our chances of severe weather. Today we will see hit-and-miss showers and storms as we await the arrival of a powerful cold front that is setting off storms to our west. We are looking at a 20% chance of showers and storms during the day while temperatures work their way to a muggy 83 degrees. Winds will be a bit brisk at 15 mph from the SSW, with gusts possible up to about 25 mph. The NAM4 model wants to put some strong storms possible over Hickman County at about 9am today, however the HRRR is showing only scattered showers. I’m thinking it may hit between both of these as hit-and-miss scattered storms. Tonight is when things get interesting. We are expecting a powerful cold front to come through overnight tonight that could set off some showers and storms. The SPC has us barely inside of the “ENHANCED” category for severe weather. They have backed off of how much area is in the ENHANCED category since yesterday’s update – a positive note. Update 3:30pm 4/9/15: The SPC has pushed Hickman County out of the “ENHANCED” category and into the “SLIGHT” category now. Below is the 3pm updated SPC outlook for today (that runs to 7am Friday morning). It doesn’t look much different than it did, other than the “ENHANCED” has been pushed to our west – a good thing. This will be mainly a damaging wind and large hail event. The SPC has us in the 2% chance of seeing a tornado within 25 miles of us. This is the good news, however, in Tennessee in the spring with these cold fronts, we can never rule out tornados completely. There is still an isolated chance. Update 3:30pm 4/9/15: This still hasn’t changed for us with the 3pm SPC update. Updated graphic below. The bad news is that damaging winds and hail could do some damage. The SPC has us at a 15% chance of seeing hail one inch in size or bigger within 25 miles of a point. Update 3:30pm 4/9/15: This hasn’t changed for us. They split our county in half with their line, but let’s just call it 15%. Updated graphic below. In addition, the SPC has us at a 30% chance that we will see some wind damage with 55+ mph winds within 25 miles of a point today. Update 3:30pm 4/9/15: The SPC has backed off slightly the probability of us getting wind damage, putting us in the 15% chance that we will see some wind damage with 55+ mph winds within 25 miles of us. Updated graphic below. A STRONG COLD FRONT WILL SWEEP ACROSS MIDDLE TENNESSEE OVERNIGHT. OVERNIGHT PERIOD AND POSSIBLY INTO EARLY MORNING FRIDAY. 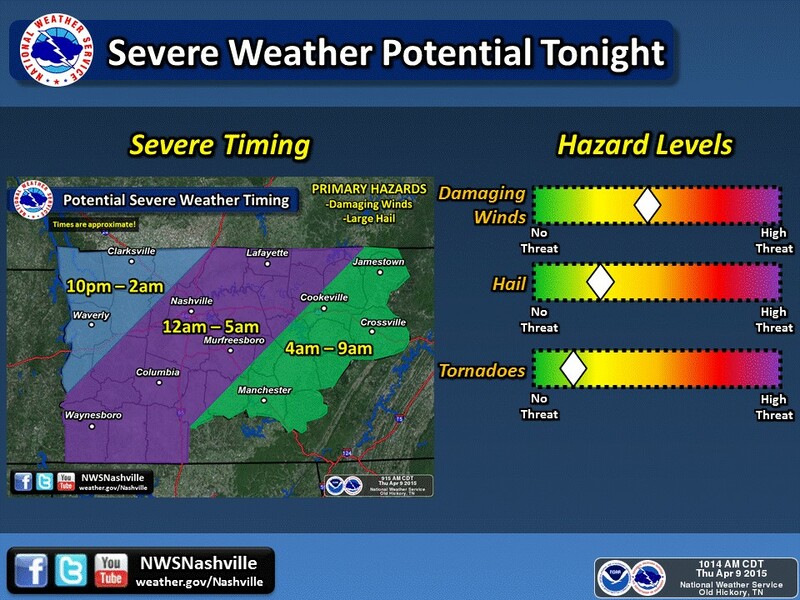 NWSNashville has put out the following timing estimate of the storms tonight. Updated 3:30pm 4/9/15: The NWS has issued a new graphic along with outlining the threats and timing. Updated graphic below. 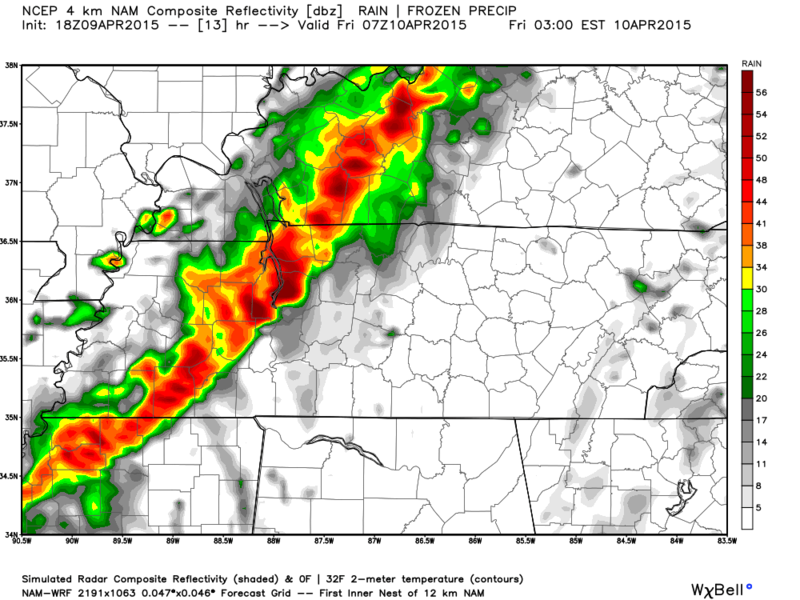 Updated 3:30pm 4/9/15: The NAM4 model is wanting to show some possible strong to severe storms ahead of the main cold front. Here is the model simulated radar at 8pm tonight. Note – Don’t focus too much that it is right over Hickman County. I believe this is just an estimate. Strong storms could be anywhere in Mid TN at this point. Updated 3:30pm 4/9/15: The latest timing of tonight’s storms comes from NAM4. 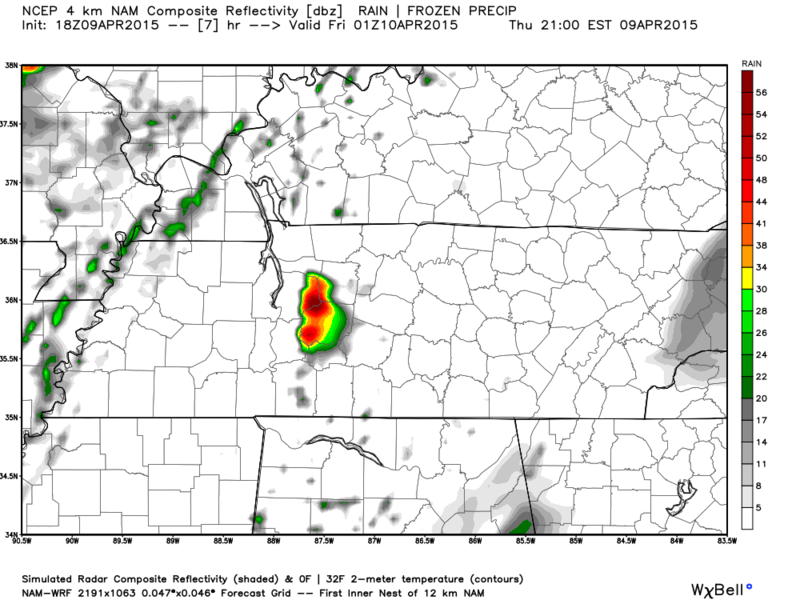 NAM4 believes we will see the edge of the storms come into Hickman County around 3am 2am to 3am Friday morning. It’s possible that we may see a few strong to severe storms develop ahead of this cold front (see statement above). Updated graphic below. We hope the cold front loses enough of the daytime heating that it loses intensity before it gets here Friday morning. However, severe weather is still possible. Have your weather radios next to your bed tonight and DO NOT rely on thunder to wake you up. Now is the time to get your severe weather plan in place. We’ve written a little bit about what to do when severe weather is forecasted. Also, as a friendly reminder, please keep in tuned to more than one reliable weather source during the day, as well as keep your eyes on the radar. As always with severe weather, spotters always help the NWSNashville know exactly what is happening under the radar. They have requested that spotters be alert. Trained spotters need to call in reports. Those who aren’t trained can report anything above to the NWSNashville on Twitter using #tspotter. Hail is best reported by using the size of a coin (pictures with a coin are perfect). Any of the above is important as well. Also, if any weather event has caused damage to personal property or has/is putting lives in danger (lightning struck a house, flooding close to a highway, etc.) those are helpful and needed too. We will update this post today as we get more information and the event gets closer.